Joe Paprocki’s book is making the rounds. Turns out the author’s a blogger. That’s a good sign. The DRE at my new parish had a stack of them to give out to some of her catechists. Hmm, I thought when she opened her package from Loyola Press, this must be a good book. It is. Joe must be the kind of catechist liturgists like. I like the way he thinks, he presents his material, and how his book is organized. 157 pages with illustrations, outlines, Scripture passages, prayers, and quotes won’t tip the scales as heavier that the Catholic catechism. If you want the depth of the catechism, use that book instead. But if you’re preparing to share your faith and teach it to others, I’d throw my lot with Joe Paprocki’s effort. 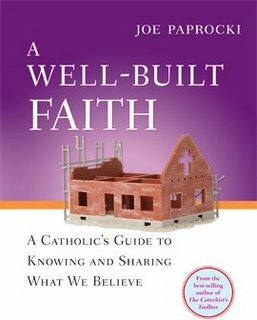 Here’s what I liked about the book: Joe uses the broad outline of the catechism and gives a sparkling summary of church teaching in eighteen chapters shared among four parts. There’s humor–healthy humor. You can scan the book and catch some good quotes, many bullet-point outlines, pertinent stories, and a few key ideas. You can read a chapter at a time and go into church teaching with a little more depth. I suppose you could go cover to cover–it’s an engaging read. From this book, if you wanted to, you could springboard into the catechism and go whole hog. Each chapter concludes with a Scripture passage and a prayer. These are helpful whether you’re just reading the book by yourself, or using it as a group exercise. As a liturgist, I always go to a liturgy & sacraments section of a book like this and see if it measures up. Well done, here, too. There are some apt quotes from the spiritual life, and I think Joe does an excellent job of balancing the importance of the outward approach and the interior life a Catholic can bring to the sacramental expressions of the Church. Strongly recommended for catechists, or anybody who wants to get excited in a positive way about presenting the faith to others. Thanks so much for this wonderful review of my book! I especially like the fact that you tell people that they can use this as a springboard to the Catechism which is precisely my hope! I like your blog…keep up the good work! Joe wrote a very good article for Ministry and Liturgy (June-July) called “Through Hymns, with Hymns and in Hymns”. He talks about the catechesis of sacred music. He’s convinced that if we were forbidden to use textbooks to teach the faith, we could still do so with a hymnal. I enjoy his writing and his blog. Indeed, there is only one hymn you have to hear to understand the Eucharist: Lauda Zion.